Nice, neat crocheted scrubby pad on the left…Lazy Lisa’s wadded up netting scrubby on the right. In case you were wondering. I have several scrubby pads that work great for washing dishes and cleaning. 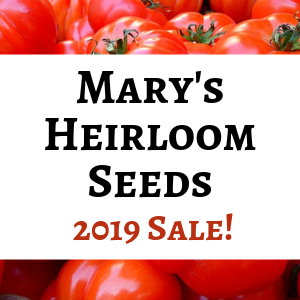 My Mom gave me some and I purchased several at a farmers market. They last a long time and can be made from recycled mesh bags (the kind that oranges and onions are packaged in). I use these scrubbies pretty much every day. 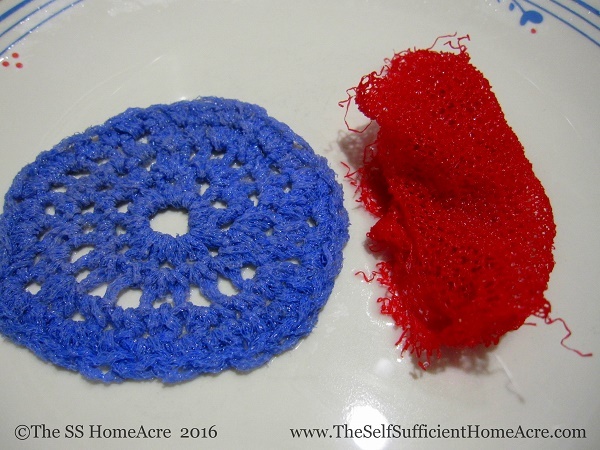 I first found directions for crocheting scrubbies on Making Our Sustainable Life. Vickie, the author, gives instructions and a cute poem to include with your homemade scrubbies for gift giving. I loved it! I really wanted to try making my own, so I started saving up nylon net bags. There’s just one little glitch…I’m lazy. Yes, I admit it. It might seem odd that I’m willing to raise and butcher my own chickens, but I’m too lazy to crochet scrubby pads. Ok, there’s a second issue here, and that is… I don’t know how to crochet. My Grandma taught me to crochet a chain and she attempted to show me more, but I was more interested in riding horses and hiking through the woods. So, ultimately, I guess I’m just too lazy to learn to crochet in order to make my own scrubbies. The other day I found my stash of nylon net bags under the kitchen sink and it occured to me that maybe you don’t have to crochet them. Maybe you can just scrub with them wadded up in a ball. I tried it and guess what? It worked! Before you try using wadded up nylon net bags to scrub your dishes, be sure to check for little metal bands on the ends. They will scratch things up. This lazy scrubby won’t last nearly as long as a crocheted one, but if you buy oranges you are likely to have a ready supply of new net bags to replace the old scrubbies. I think that you could fold the netting neatly and take a few stitches with a needle and nylon thread to hold them in shape. This may extend their life and make them look nicer. I haven’t tried it yet because, you guessed it, I’m lazy! Note: If you’d like to give scrubbies as gifts, I suggest using Vicki’s instructions for crocheting your scrubbies. My wadded up, recycled scrubbies probably won’t look as good in a gift basket!